Snapping turtles developed adaptations for survival during prehistoric times. Turtles, alligators and other reptiles survived the dinosaur age and continue to thrive in modern environments. Snapping turtles have advanced defense mechanisms and predatory habits that make them effective feeders. They thrive in many regions of North and Central America. Snapping turtles share the adaptive quality of a shell with all turtle and tortoise species. The alligator snapping turtle species has the addition of horned points on the shell to deter predators. The shell on all snapping turtles provides protection from predators and shelter against the elements. Snapping turtles have a long neck capable of rapidly contracting and expanding. The neck allows the turtle to retract inside the safety of the shell and expand to kill food. The neck is flexible and can twist to catch prey in odd positions. The mouth has a pointed beak designed to stab and kill prey. The jaw is strong and designed to clamp and hold prey until they die. The powerful jaw also acts as a defense mechanism against other animals. The nostrils are located on top of the head, which allows the turtles to breath while sitting in water. 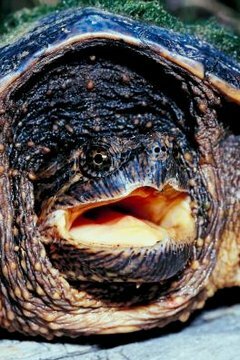 Snapping turtles have adapted to digest a variety of food sources. They eat plant matter, flesh and insects. They primarily prey on smaller reptiles, small fish and insects. They also eat crayfish and crustaceans when they are available. Snapping turtles have long claws designed for digging and foraging. They use the claws to move dirt for insects and eating plants. They also use them for digging in sand before they drop fertilized eggs. The feet are also webbed for swimming. Snapping turtles have adapted to blend with their environment. They live in swampy waters and sandy river bottoms. The green shell and skin blend with the plant matter and murky water. They also have a broken pattern with some shades of tan and brown to camouflage.